Just read this article and it's nicely written! I often do not like to do this whole Asian/East vs West mentality but I too am sick and tired of foreigners being surprised when we speak English, that Singapore is such a modern city (hello...I think a lot of other Asian cities/countries are modern too) and describe our efficiency as 'cold' or 'antiseptic'. Singaporeans are humans too. We have emotions and if we were 'cold', there wouldn't be so many of us complaining about anything everything under the sun. And we have a lot of sun, considering we're in the tropics (yes, I'm being sarcastic). Sorry that we're not as 'exotic' as other Asian countries. We're charming in our own way, ok? What I find most infuriating (ooh...I used a big word) about all these Western journalists (mind you...I'm not saying ALL Western journalists) is this: a country's founding father has just passed away and the nation is grieving, but they use that as a platform to insult the country that he helped build. 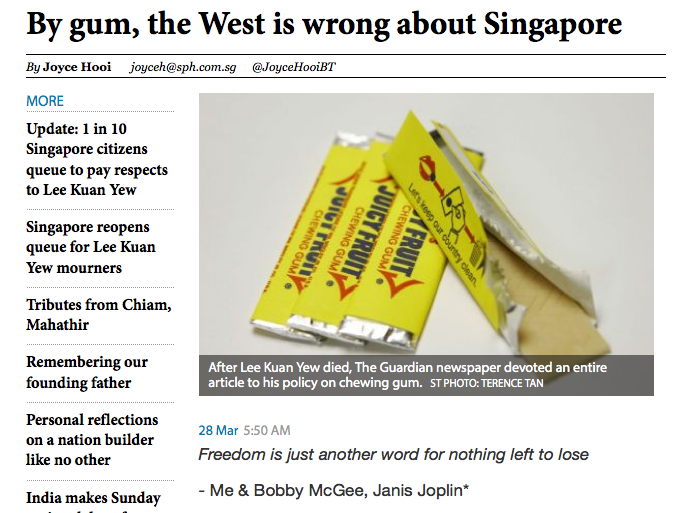 That is plain RUDE and it's lousy journalism to write about THEIR own complaints about Singapore before grudgingly writing an obituary about Mr Lee. If you were so concerned about Singaporeans' lack of freedom of speech, lack of freedom in general, inability to chew gum and being so highly efficient...why not ask us Singaporeans about how WE feel about all these rules and regulations? We're not mindless idiots as you can tell from how many of our citizens have graduated from top universities and from how well we're doing internationally when it comes to academics. True that in terms of athletics, we're still a bit behind but then...we're only 5 million people so the stats aren't really in our favour. Is there such a thing as a PERFECT country? Is there such a thing as a PERFECT government? No. Lots of people like to preach about freedom/democracy/love/acceptance/plurality of opinion/open-mindedness, all of which are good things to have. However, it is startlingly clear that a lot of these journalists who are preaching about all these qualities lack one valuable skill - listening. I'm born and bred in Singapore and have stayed in a few other cities for 1-2 months (Fukuoka, London and Melbourne) and you know what? I still prefer living and working in Singapore because I'm not discriminated against as a woman who wants to climb up the corporate ladder; I don't have to care about sorting my rubbish unless I want to be environmentally friendly and I don't have to care which day to dispose of said sorted trash in case my neighbours frown and complain about me; I need not worry about being mugged/stabbed/gunned down on the street if I'm walking home alone at 11pm from the train/bus station (a jogger was stabbed 10 min from where my bro and I stayed in London). How many Singaporeans or foreigners who have lived in Singapore will it take before these pompous journalists will start listening to what WE have to say about all these things that THEY are complaining about OUR country? They ought to take their own advice and be open-minded. There. I've exercised my supposedly-lacking freedom of speech.